Serve as a side to grilled chicken or fish. You could also serve this with the super green salad or have a small portion as a snack. 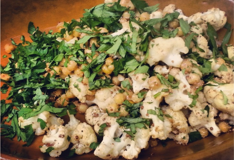 To make in advance leave the cooked cauliflower in a covered bowl and keep the dressing and parsley separate to be dressed before serving. Serve at room temperature.